Spoiler warning: This news article contains minor spoilers for Breath of the Wild. If you don’t like spoilers or would prefer to discover everything in the game for yourself as you play it, now’s your chance to turn back. Quickly, be gone with you! Game Informer magazine is covering Breath of the Wild in depth this month, and Nintendo has given them an exclusive look at content in the game that hasn’t been seen by anyone outside of Nintendo until now. 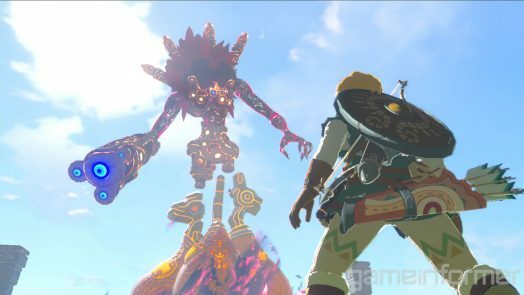 They have released a batch of brand new screenshots that reveal new facts about the game, including general details about enemies and bosses, and confirm the return of a Zelda character we’ve seen before. If it wasn’t bad enough that Link can inadvertently run into scenarios and enemies far too tough for him in the game, the forces of nature may work against him too, for our brave hero can be struck by lightning. 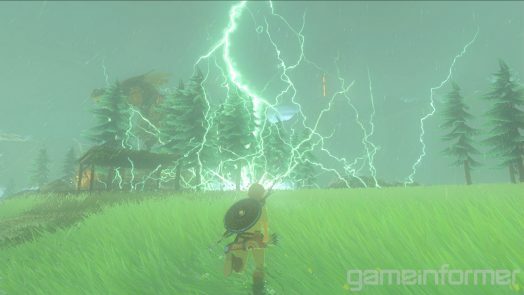 Game Informer say that players will want to unequip any metal items they’re carrying during storms in order to reduce the chance of being struck. As someone who loves seeing attention to small details and consequences of random actions in video games, this revelation makes me incredibly excited. I may even put this mechanic to the test and leave my metal items equipped, although I suspect I’ll quickly end up regretting it! Players who love a challenge are in for a treat: Game Informer confirms that some of the enemies you’ll encounter at random in the world will post a “significant challenge” to Link. If he’s able to take them down, he’ll be able to use their powerful weapons. Each dungeon will have its own boss, which will require “special tricks” to beat. Let’s hope that these tricks are more clever than “obvious weak spot” and “use the item you just found”. The screenshot below shows what is presumably one of the bosses. Intimidating! 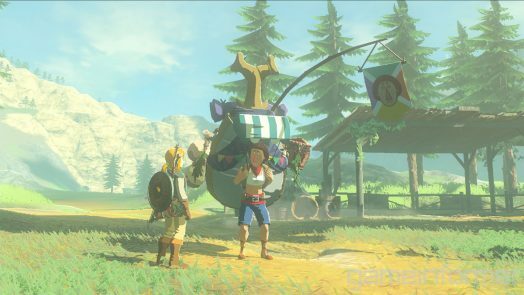 Our favorite shopkeeper Beedle will make a return in Breath of the Wild! This time, he appears to have taken on the role of traveling salesman. Game Informer also reveals that the world is “dense with activity”, despite being the largest version of Hyrule seen to date. This should come as a relief to anyone who was still worried that the vast world would be empty like it was in Twilight Princess. You can view these screenshots on Game Informer’s website. They have even more, but you’ll need to subscribe to their magazine in order to view them.